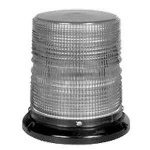 Our 3000 Series Strobe Beacon is a great safety enhancement to your vehicle by providing 360 degrees of bright strobe output enhancing your visibility on the road. Made with a rugged black polycarbonate base & Double Fresnel polycarbonate lens this is one tough beacon that can endure the harshest outdoor conditions. Remote or Self-contained models available. Self-contained beacon has a built-in power supply providing two user selectable flash patterns. No need to worry about CA Title 13 requirements when you use our Clear Dust Cover (# E36ØDC6). Beacon has a 1 Year No Hassle Warranty.